US demand for oil and gas drilling products and services is forecast to increase to $71 billion in 2019, reflecting average annual gains of 3.0 percent. Services will remain the dominant segment while fluids will grow the fastest. The Eastern and Western US will be the fastest growing regional markets. 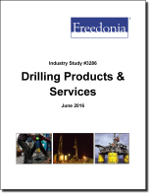 This study analyzes the $60.8 billion US drilling product and service industry. It presents historical demand data (2004, 2009 and 2014) and forecasts (2019 and 2024) by product (e.g., tubular goods, rig equipment, pressure control equipment, drill bits, downhole tools, drilling fluids) and service (e.g., contract drilling, logging and measuring, directional drilling) for four regional markets and 17 state markets. The study also considers market environment factors, details industry structure, evaluates company market share and profiles 33 industry players, including Schlumberger, National Oilwell Varco, and Halliburton.